NAS Market « Global Market Insights, Inc. 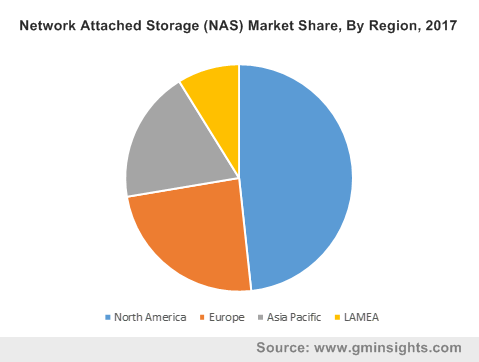 The commercialization of global network attached storage market has indeed taken up a remarkable pace in the recent years, courtesy – the increasing number of enterprises diving into big data analytics & data mining. The rapid adoption of NAS solutions in home and consumer applications to offer storage that can be accessed by multiple devices have provided significant impetus to the growth statistics of network attached storage industry share. With NAS gaining considerable traction across SMEs and other businesses incorporating cloud-based network, analysts speculate the network attached storage architectural layout to witness a revolution of sorts in the coming years. Not to mention, technology interventions are deemed to remain the focal point of this transition. Toshiba, for instance, has recently launched its next-generation 3.5″ NAS N300 HDD and 2.5″ L200 HDD that can be now used in laptops as well. The technology, as claimed by Toshiba works perfectly with any network attached storage devices that are used for personal, home office or small businesses. The NAS device has been designed to support around eight drive bays in a multi-RAID NAS and features rotational vibration sensors that automatically detect & compensate for transient vibrations, thereby delivering prompt performance in multi-bay storage enclosures. In yet another significant instance, the Taiwanese technology company Synology has recently announced the availability of its “18-series” NAS servers in India. Reportedly, the servers are designed to serve as personal cloud storage with features such as media streaming, data backup, file sharing, photo management, and more. The instance further emphasizes another vital strategy undertaken by NAS market players – exploiting the enormous potential in the untapped economies. The increasing technologically advanced and aware consumer base is one of the chief regions drawing the stakeholders’ attention toward these emerging countries. Speaking along similar lines, the APAC region, as forecast by Global Market Insights, Inc. is slated to register the fastest growth rate over 2018-2024. The rapidly proliferating trends of digitization coupled with the rising demand for cost effective & scalable data storage solutions are overt to further sway the regional industry outlook. North America, being a major technological hub stands poised to hold significant share in the global NAS industry. The region moreover retains the presence of large scale enterprises that have adopted the cloud platforms and big data analytics – a factor further expected to garner high demand for NAS solutions in the coming years. The rapid adoption of consumer and home network attached storage systems in U.S. and Canada across various end-use sectors such as the BFSI and IT & Telecom market have significantly driven North America network attached storage industry share. The United States NAS industry share is forecast to record a y-o-y growth rate of 20% over 2018-2024. Elaborating further on the geographical landscape, Europe is projected to procure second largest share in the NAS industry. The growth is mainly attributed to the rapid adoption of this technology by the SMEs in tandem with the massively growing data center developments in the region. Add to it, the continent, over the recent years, has been one of the top-notch spots for the industry players adopting regional expansion as their chief growth strategy. All in all, endorsed with a rich competitive and application gamut comprising BFSI, IT & Telecom, healthcare, retail, consumer electronics, etc., the global network attached storage market is certain to become one of the most remunerative business spheres for potential stakeholders. In terms of commercialization, Global Market Insights, Inc., projects network attached storage industry size to surpass USD 20 billion by 2024. This entry was posted in Sustainable & Smart Technologies and tagged 1-bay to 8-bay, 12-bay to 20 bay, 8-bay to 12-bay, above 20-bay, Architecture, Cloud, Consumer NAS Market, Consumer Network Attached Storage Market, Deployment Model, Design, Home NAS Market Size, Hybrid, NAS Market, NAS Market Leaders, NAS Market Share, NAS Market Size, Network Attached Storage Industry, Network Attached Storage Market, Network Attached Storage Market Growth, Network Attached Storage Market Share, Network Attached Storage Market Size, On-Premise, Scale-out, Traditional.